Winter is here well and truly and it’s time for an update on this years Brass Monkey Challenge 2016. We’ve been experiencing minimums of 0 – 5°C (32 – 41°F) during the night, and daytime temps of 10 – 15°C (50 – 59°F). Whilst it may not be cold for some of you, it’s all relative, because in summer we have daytime temps of around 27 – 45°C (80.6 – 113°F). 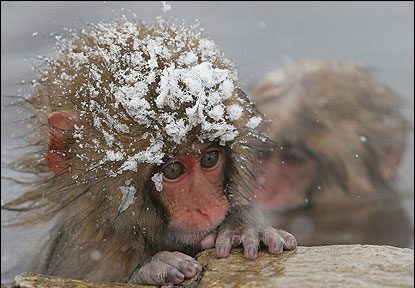 Not a cold as this little fella! So to save on energy bill, particularly natural gas, a couple of years ago Kim and I decided to give ourselves a challenge to see how long we could stand not having the heating on in the house. Could we handle it and use behaviour and passive heating to keep warm? Well the answer (for the 3rd year in a row) is a resounding YES! It’s been quite easy. We even gave it a name. The Brass Monkey Challenge! Our single wall furnace does not even have the pilot light lit, and we have managed to stay warm so far. During the day we wear a few extra layers and use passive solar heating by letting light flow into the north facing rooms. This heats up those rooms and we let use those rooms in the evening. At night we shut all the internal doors of all rooms which keeps the ones we’re in warm. We also pop on another layer of clothing and throw a couple more blankets on the beds for when we go to sleep. With my office door closed and my computer turned on, the room heats up to a comfortable 18°C (64.4°F) in the evening. As it is also one of those north facing room with a double glazed window, it gets up to about 22°C (71.6°F) during the day. Kim’s office is south-facing, so need an hour of heating first thing in the morning with the reverse cycle air-con, then that’s it. It stays warm all day. It has been because we’ve invested in the comfort of our home as well. We fitted double glazed units to all the north facing windows. You can read about the double glazing installation here. We also added extra insulation batts to the roof space. That has been a vast improvement of the heat holding properties of each room. 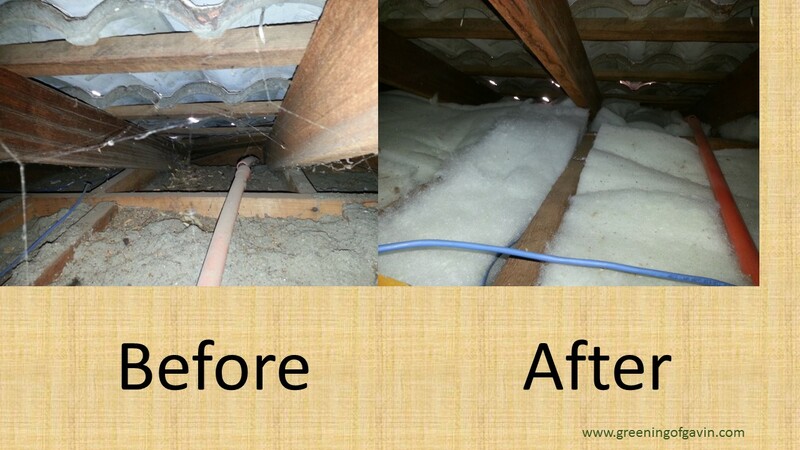 The installation of the extra insulation in the ceiling was document here. 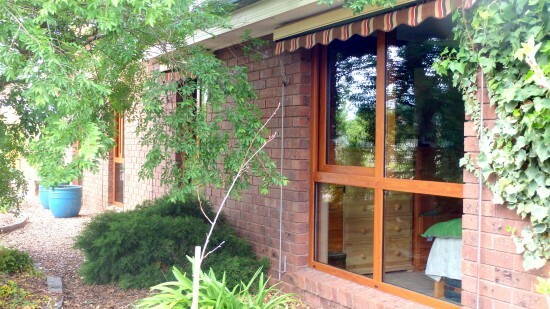 All external doors are solid wood and have draft strips that shut when closed. We also have draft snakes against the inside of those doors, just in case. All other windows have closed pelmets fitted to stop cold air circulating behind curtains and have draft strips where necessary. So there you have it. That’s our Brass Monkey Challenge 2016 and staying warm and cozy. Although we are not swanning around in T-shirts and short (and neither should you in winter), it is definitely possible to not have any heating on in a cool/temperate climate and stay warm. You also save on your energy bills as well and reduce greenhouse gas emissions. Wins and high-fives all around. For other tips about how to stay warm in winter without the need for heating, have a listen to our podcast episode about our original Brass Monkey Challenge. Have you tried a similar challenge at home? We would love to hear about it in the comments! Our comfortable home transformation is nearly complete. 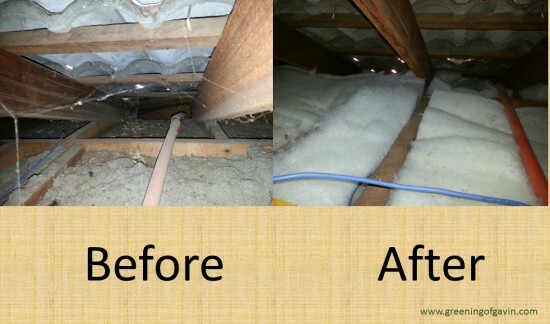 We now have thermally efficient ceiling insulation! Boy, does it make a difference. 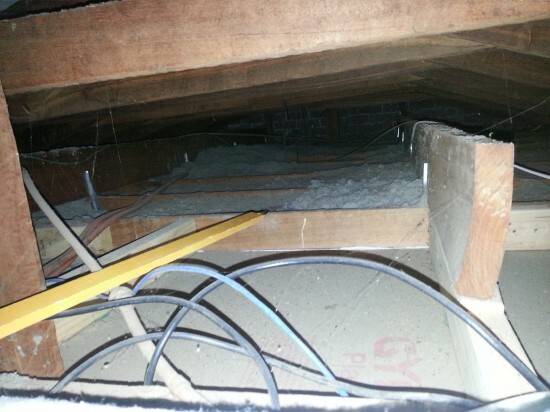 So let me take you on a ceiling insulation top up journey. A while back we booked a thermal assessment for our home with ecoMaster, a local company who operate out of Gisborne. They suggested that we needed to top up our ceiling insulation as the blown cellulose pulp (aka pulped newspaper) was not up to the job. We kind of new that, because whenever I had ventured into the roof space, I noticed that there were always varying depths of the pulp on top of the ceiling plaster board. So, we saved our pennies and booked the installation. The team from ecoMaster arrived on time as promised, and the two gents, Garth and Alex were nice blokes who knew their stuff. Funnily enough, they were just like us; green. The product they used was called GreenStuf. It is made from recycled PET bottles. 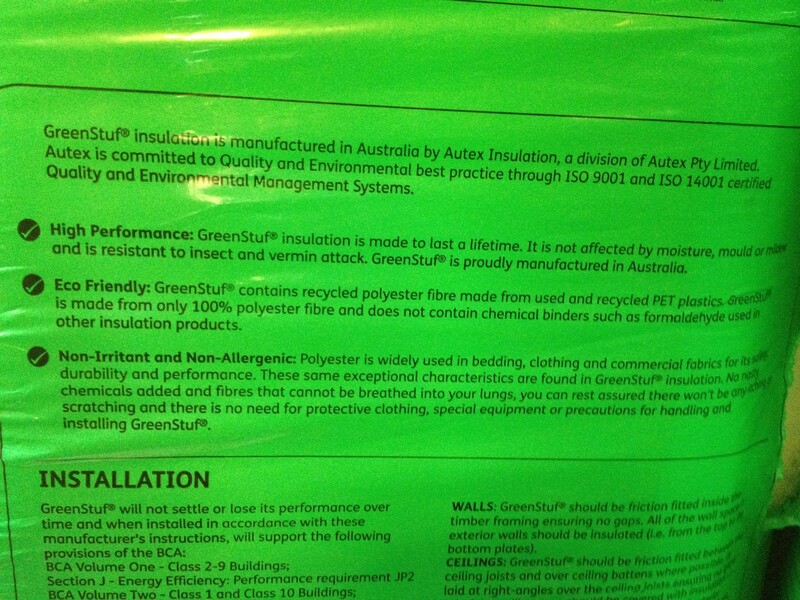 It also does not contain any formaldehyde which is sometimes used as a binder to hold the fibres together. It is also made in Australia, so we are supporting local businesses. Pretty cool stuff. 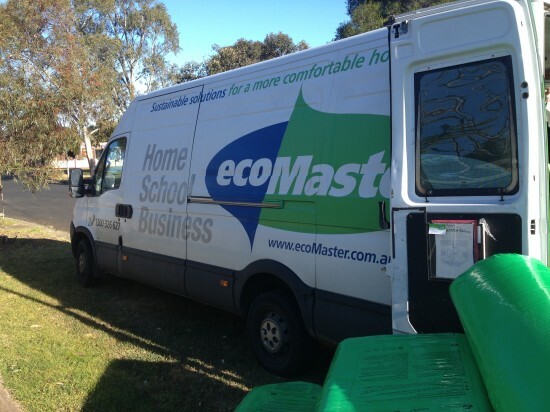 We love the fact ecoMaster uses products that are made from recycled materials. 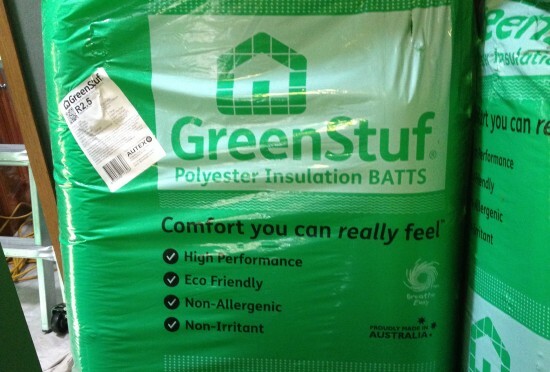 When installed correctly, it provides an insulation value of R2.5. 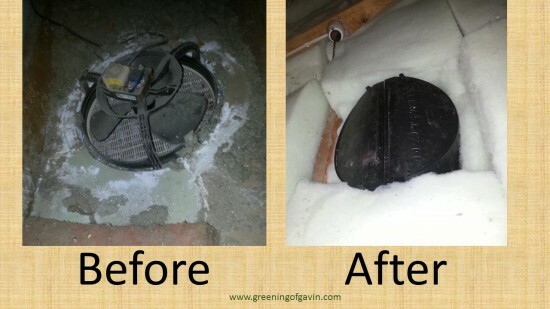 The gents were kind enough to take some before and after photos for us while they were crawling around the roof space. 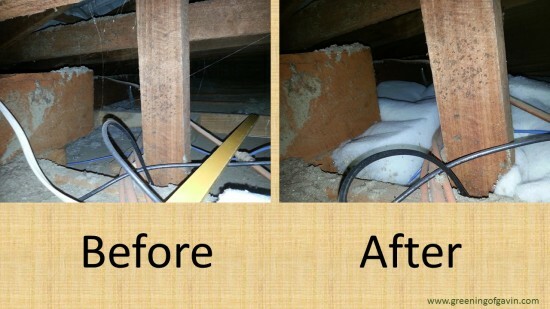 They even found some areas that were void of insulation completely. No wonder we had rooms that were hot in summer. Some of the spaces were fairly tight, so they certainly did a great job at fitting the stuff. During their brakes, Garth and Alex learnt about all the cool things we do to live a more sustainable lifestyle, and I even gave them a tour. They both talked about how they incorporate simple and sustainable living in their own lives. It was very refreshing to talk to them both. Closer to the edge of the eaves, they found more areas that were void of blown pulp. I don’t know how they crawled in there, but they covered up the gaps. Also there was a massive gap around the bathroom extractor fan, so they fitted a cover which is known as a top hat. It has two flaps that rise up when the fan is turned on. 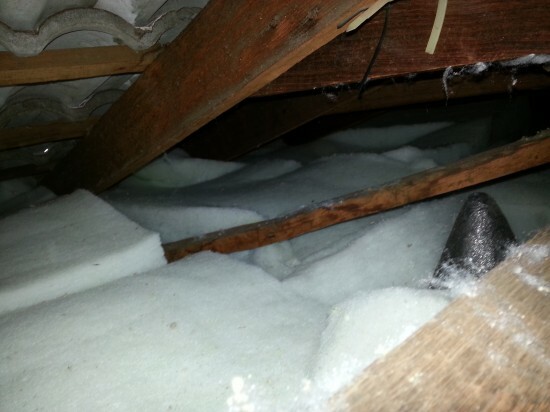 You can see that the gap is no more and the insulation is nice and tight around the top hat. As for the downlight mitts that were installed a few weeks back, the insulation was able to be placed right up next to it. No more gaps around the light fittings, and no more heat ingress through these ceiling holes. So did it work? Well today was proof that it did. It was a unseasonally warm spring day at 28°C (82.4 F). The inside temperature stayed a comfortable 22°C all day. Additionally, a few days ago it got down to 5°C in the morning and it was still a very comfortable 18°C inside without any heating (not that we have had any on all winter). And the cost? All up it was $2107 including installation. Oh, and Kim gave them a few bars of soap. Not because they were dirty, but because no one leaves our place without a home-made gift! It is just the way we are. We are due to have double glazing installed mid-October, so that should also reduce the insulation factor of the north facing rooms, which get the hottest in summer. Looking forward to having a more comfortable home during our Angry Summer and to reducing our reliance on air-conditioning! It should save us swags off our power bill. During the challenge we hoped that by not heating the house we would save a bit of money on the gas bill. Surely it would reduce from the same period last year if we didn’t turn on the gas space heater. So you can imagine my surprise when our gas bill arrived in the post and it was slightly higher than our winter bill last year! A daily average of 80.24 MJ per day up from 75.46 MJ last winter. WTF???? Hang on a minute, I thought, as I scoured over the details. There has to be something wrong; how can it be so? Once I had calmed down, I managed to figure out that it was an estimate only. I hate that. The excuse on the bill was “dog” which is strange because the dogs are rarely outside during the day except for ablutions – especially during winter – and we usually wait out there with them. 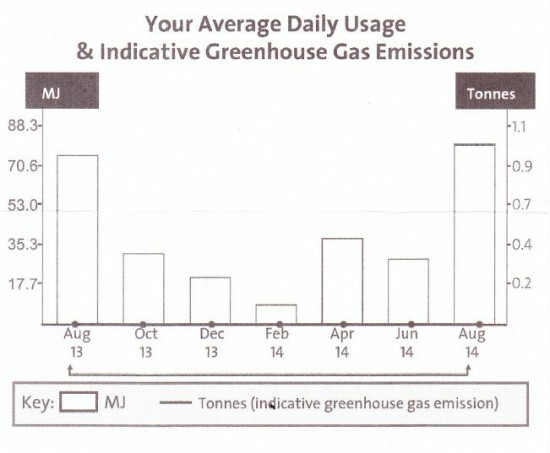 Anyway, I quickly read the gas meter and worked out that we had actually only used a daily average of 36.77 MJ per day! Success at last. In reality, it cut my bill in half. But here’s the rub. Because I would have to pay to have meter re-read, we chose to pay the bill and get a credit next billing cycle. There should be $75 coming my way. So it was worthwhile in the end, financially. We didn’t feel uncomfortable and if we did start to feel a chill, we put on another layer. If you are interested in how we fared during over the winter, check out the other Brass Monkey Challenge posts. Now that we know that we can survive without heating, next year will be easy. Especially when in a few short days we will have extra insulation in the ceiling cavity and in mid October the north facing windows get replaced with double glazed units. Not only will we have no issues keeping the place warm next winter, it will also keep out the heat in summer. Looking forward to reporting our next liveable home update on Wednesday!